speeding truck from the side. He arrived approximately 45 mins after the accident. He was intubated along with spinal immobilisation. A chest tube was inserted. was controlled and the fracture site stabilised. A FAST scan was positive for free fluid in the abdomen. Surgery, orthopedics, neurosurgery, cardiothoracic and anesthesia were now called in. 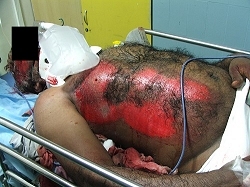 He was taken to the OT, bleeding from a 6cm hepatic laceration was controlled. Fractures were fixed. He remained in intensive care for 11 days. He made good recovery and was discharged following two more operations. to teach a simplified and standardized approach to trauma patients. they were treated was inadequate and inappropriate. and began US and international dissemination of the course. by the ATLS and ATCN trained poviders in the hospital. and treatments with the most time critical interventions performed early. Which are d centres for ATLS in ASIA N MIDDLE EAST ? Looks like there is something really important missing around the patient's head and neck area. Ok then the holy trinity of C-spine immobilisation. tapes to secure head blocks. Think the last two of the trinity are missing in the picture provided above.